Buying A Website And Domain? Domain name front running occurs when someone monitors a currently non-existing domain name with the intention of buying the domain before a person searching for that name can buy it. Go to the registrar with a few domain names that you would purchase. Don’t check their availability by typing the name into your window – that query will be noted by domain name front runners. Go straight to the registrar that you plan on buying from. Once you check for the availability of a domain, consider yourself as committed to purchasing it. If the domain is available, you should buy it immediately. Always keep in mind that new domain names are cheap but second-hand domain names are not. How do you choose the right website to buy? A website’s name has to attract and maintain visitors, making it one of the most important decisions in buying a domain. First, the name must represent your website appropriately. Determine the purpose of your site. Depending on if you are using your website to sell products, blog about your life, or showcase your latest photos, relevant names for your website will vary. Keep in mind, however, that the name must be catchy so that visitors will remember your website domain easily. Catchy names that are simple to spell will be the most successful, but shorter names often come with a price. 3-4 letter names are expensive, so you can increase the name to at least 5 letters with more than one word to make the domain name more affordable. Additionally, adding “the” or “my” before the name will decrease the price. However, it may hurt the performance of your domain name. Similarly, if your domain name intentionally misspells a word, expect to lose visitors to the properly spelled version. There are many factors to consider when deciding on which domain name to buy, and searching for the perfect name becomes a balance between relevance, price, and length, to name a few. However, it all ultimately comes down to choosing a name that is memorable and accessible for visitors. Do your homework. You should ask for detailed statistics and analytics, especially relating to traffic and revenue. The higher the asking price, the more documentation should be provided, and all of the numbers should be verified. Now that you have your name, you have to do your homework before making a purchase. If you know the name you want already exists, you can find the owner through a WHOIS search. This feature is available on most registrar sites and it provides you with the available contact information tied to the domain name. Contact the owner and ask if the name is for sale. If you would prefer to do so anonymously, you can make a generic email account and contact the owner in such a way that you do not give personal information away. However, this often looks like spam so you may not receive a reply. Another option is to contact the owner through a registrar service for a fee. Once you are in contact with the owner of the domain name, you should get as much information as possible. Ask for detailed statistics and analytics, especially relating to traffic and revenue. The higher the asking price, the more documentation should be provided, and all of the numbers should be verified. You can also ask the seller to install Google Analytics onto the site and allow you to access the data personally, so that you can make an individual assessment of the site’s performance. Once you have your information, you should take a look at key metrics that are indicative of a website’s success and value. Total Visits: Total visits is the most important statistic because it measures the amount of traffic a website achieves per day. Make sure to consider trends in total visits so that you have an idea of what drives traffic to the site. Does this website require costly advertising campaigns to maintain a high number of total visits? The total visits metric is a key indicator of the fundamental health of the website. Traffic Segments: Alluded to in the previous section, it is important to consider how visitors reach your site. Potential traffic segments include direct traffic, referral traffic, and organic traffic. Direct traffic is visitors that come to the website directly through the URL. Referral traffic derives from traffic that is linked through other websites. Lastly, organic traffic comes from unpaid listings on search engines. Traffic segments can give you a glimpse into the success of SEO; a healthy website usually has 40% organic traffic and 20-30% referral traffic. New Visits: This is the portion of your total visits that are unique views, compared with repeat visitors. The new visits metric can give you a sense of how many people return to the site and if different acquisition strategies are needed. A good website will have around 15% repeat visits per day. Lastly, you should always keep in mind that you are buying the website, so the listing and transaction should consist only of the site itself. If the domain name’s value is tied to the current owner, rather than the actual features of the site, the website may not succeed under different ownership. You can use various tools to see what content has previously appeared on the domain. Below are just a few examples of the resources available to buyers of domains. UrlTrends will let you see search engine information such as the PageRank or AlexaRank on a URL. Wayback Machine allows you to browse snapshots of a Website from over a decade ago. Given that they have not been penalized, older websites are more trusted by search engines. It is also a great way to find out how your future domain name has been used in the past. Google Banned Checker will help you avoid buying a website that has been banned by Google. Google Banned Checker tells you if a domain has any pages that are indexed by Google. If a domain has nothing indexed, then the website is either new or banned. You have a domain name with good analytics and a clean background. Now, how do you buy the domain? 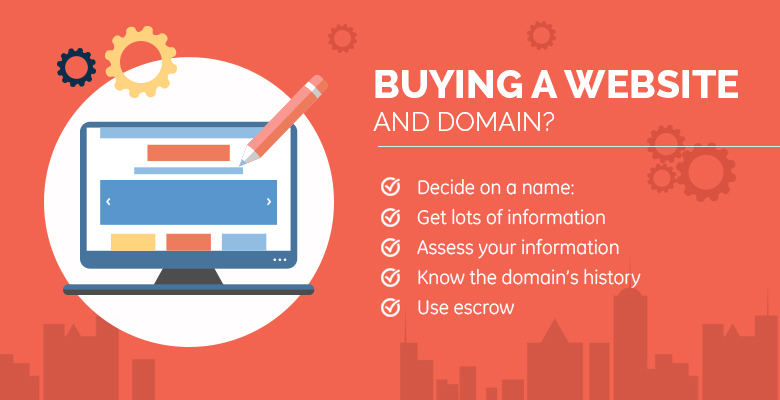 In order to facilitate a successful transaction, buy your domain through Escrow. Escrow.com is a government-licensed and audited third-party site used to buy and sell domains. It will protect you as the buyer by withholding payment until the domain name has been properly transferred. After purchasing the domain name, make sure that the domain is registered in your name and that you are listed as the administrative contact. This seems simple, but it often goes overlooked, and without the proper registration, your website may not belong to you. Remember to renew your registration. It may help to purchase registration for multiple years upfront, rather than having to remember to renew the registration each year. You can also set up an auto-renew payment, but keep in mind that your credit card could expire. It is common for website owners to lose their domain name after they failed to renew their registration.